We’ve just has five days of high pressure over the UK. It has not been unusually cold, nor has there been any snow over lowland areas as far as I know. Indeed, temperatures have been close to normal in the last week. What you might call a typical spell of quiet, dry weather for this time of year. Onshore and offshore wind combined have averaged 2051 MW over the period, meaning they have been operating at about 10% of capacity. Average demand has been 37.5 GW, so wind power has contributed just 5% of the total. It has by no means been a windless period, and some days have been quite breezy. In fact, wind output has varied between 801 MW and 4253 MW. Solar power is virtually irrelevant at this time of year. Despite some sunny days, it has averaged just 465 MW, little more than 1% of demand. Total installed solar capacity is 13.1 GW, so capacity utilisation in the last week has been about 3%. 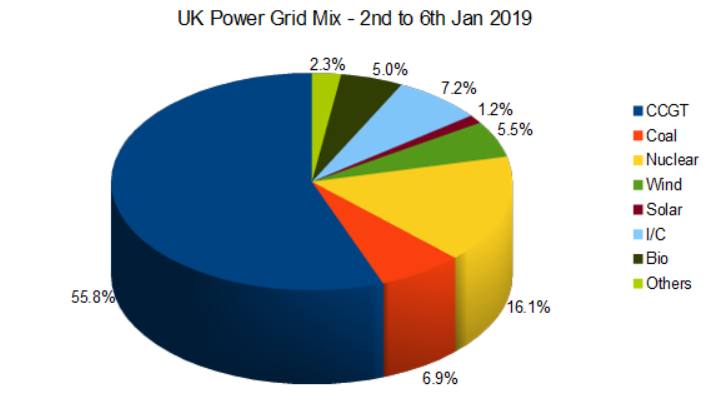 As a consequence of all this, we are still relying on coal for nearly 7% of our electricity, more than wind and solar combined. Demand has peaked at about 46 GW, and at these peak periods CCGT and coal power have been running at about 26 GW and 6 GW respectively. Giving a total of 53 GW. I must stress that this last week has not been particularly cold. With temperatures below freezing and snow on the ground, we could well see total demand top 50 GW. Even with switching demand away from peaks and use of storage to smooth demand flows during the day, our current capacity is extremely tight. Without the current coal capacity, it will simply not be manageable, even allowing for maximising imports.